Swimming suits everyone, because the risk of injury is minimal. 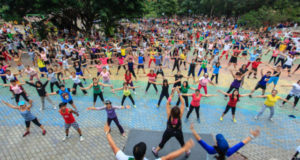 Zumba fitness is a cardio-fitness workout based on Latin American dances. Summer is favorite time of year for most people. When all the activities are on the sea, the biggest wish is that the sun is shining and the water temperature is ideal. Choose swimming as a family sport and solve stress, excess weight and enter the happiness and pleasure in your life.